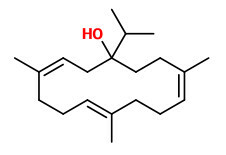 Only one synthetic incense odorant, namely 2-methyl undecanoic acid (Mystikal) with its humid resinous incense note, conveys the typical olibanum odor. α-Pinene (11-24%), limonene (11-18%) and myrcene (2-8%) were the main components of B.sacra extracts. 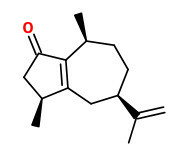 α-Pinene, β-myrcene, 1,8-cineole, linalool, verbenone, trans-carveol, carvone, thymoquinone, germacrene D, α-copaene, p-cresol, serratol, o-methyl anisole, sotolone, ethyl 3-methylbutanoate and especially two unidentified substances (A: broth, meat, spicy and and B: coniferous, woody, peppery) were identified as odor-active constituents in B. sacra. Serratol (also called 1-hydroxycembrene A, S(-)-cembra-3E,7E,11E-triene-1-ol), present at 0.3-3.2%, was described as woody, rosiny and incense-like by GC-O evaluation. The peak assigned as isoincensole and isoincensole acetate by Hamm et al. was in fact a coeluting peak of serratol and incensole, confirmed by measurements on a FFAP column. 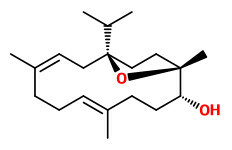 Serratol was detected in only three samples with low FD factors, so the sensory relevance of these diterpenes in B.sacra frankincense is probably insignificant.